Thank you to all our positive reviewers who have left great reviews. We have been awarded a Tripadvisor 2013 Certificate of Excellence. We are so pleased that so many of you have enjoyed your visit to our little restaurant. I heard a great saying the other day. “For every one of you who hate – there are thousands upon thousands who appreciate”. Many thanks again to everyone. We try really hard to please you all. How sad, another chain pub/restaurant in our beautiful area. Please support the small individual and unique businesses in beautiful North Norfolk not a massive chain who do not care if they have customers or not!!! They are huge conglomerates who are supported by their other pubs across the UK. Us little businesses are on our own and need your business. How sad that we have supermarket syndrome. I think you all know what I mean by that. Unfortunately these chains also serve many a boil in the bag and people think they are getting a good deal with the prices they charge!! Please think about this seriously and how they can possibly produce such cheap meals. Thank you. Settin’ theer lookin’ at Martha awl daay. Well, Oi say, “Why doant yew go in yare shud”? Thass moor’un full now, bor. Fer thuh toime bein’, Oi carn’t dew enny moor”. Come to The Old Forge and hear our real Norfolk staff in full flow and enjoy bootiful local Norfolk seafood. The less you do to a fish the better it tastes. A quick dip in a pan of spluttering butter, held down on a blistering griddle or a quiet bake in the oven is all it needs. Fish hates fuss. I cannot see the point of turning a fillet into a mousse in order to stuff another fillet. I can see even less why that fillet will appear in a sauce made from crushed crayfish and cream. I am not even sure that fish should ever appear in haute cuisine to be pummelled and poached, prettied and primped and served with a puff pastry crescent. I would rather fry fish in a bit of butter and eat it wish a squeeze of lemon and a lump of my home baked bread. Fish tantalises with ginger and lime and soothes with tarragon and cream. It satisfies without filling and digests without notice. For me it is the perfect food. Shellfish, by which I mean mussels, oysters, crabs and like is the very essence of the sea. All of which are fished off the North Norfolk coast and delivered straight to our restaurant. Lobsters as well, even better!! Local mussels have just come back into season and are the best in the world. So, so wonderful is a dish of moules mariniere with our home baked bread. The best food ever followed by a beautiful local lobster just grilled with garlic and tarragon butter. Half term is upon us soon and Norfolk is full of beautiful autumn colours with lovely weather, crisp mornings and sunny days. 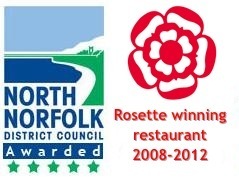 Come and stay and experience the full enjoyment of the Norfolk countryside and beautiful local seafood.